At Bath County Middle School in Eastern Kentucky, a community block party is underway. 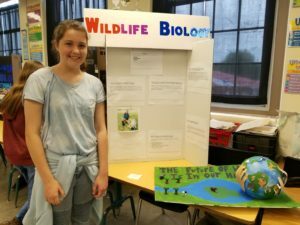 All around, students excitedly show off an incredible variety of passion projects, from homemade musical instruments and computers to an analysis of how worms interact with each of the region’s varied soil types. On one side of the room, spectators can dig through a sandbox, unearthing 3D-printed archeological artifacts and learning about their significance from the project’s creator. On another, they can pursue and purchase a homemade cookbook, the proceeds from which will be donated to a local social services organization. For those interested in meta-commentary, one student has produced a comic book documenting the process of the project itself. Some of these students generally show little interest in academic pursuits; some profess to hate public speaking. But today, passion and purpose are evident in every project, as students proudly and confidently share the results of many months of hard work. This scene is the culmination of Making a Future For All, a year-long, school-wide undertaking supported by a 2017 LRNG Innovators Challenge Grant. Making a Future For All weaves together authenticity, passion, public voice, autonomy, and peer support into a tapestry that has expanded the possibility of what school can be at Bath County Middle School. The project has created a space for both students and teachers to realize just how much students are capable of when they’re allowed to pursue their passions, with a little support from their teachers, and a lot of support from each other. Students spent the first third of the school year exploring their interests through a variety of activities across their core classes and electives. Using this as a springboard, students identified a particular area of interest, inquiring and experimenting their way to a passion project, which they then spent the rest of the year executing in preparation for display at the block party. Supporting student passion projects is itself a passion project for the team of Morehead Writing Project (MWP) teacher-consultants spearheading the project: Assistant Principal Misty Johnson, 7th grade ELA teacher Vickie Moriarity, and MWP site director Deanna Mascle. Wholeheartedly embracing the ethos they were asking their students to embody, the team chose to dive in headfirst by bringing the project to every one of the school’s classrooms in the first year. Many teachers were initially reluctant to turn their students loose on relatively unstructured projects, particularly with the final results going on public display. Unused to letting go, they were concerned about hanging their students out to dry, or exposing them to failure. 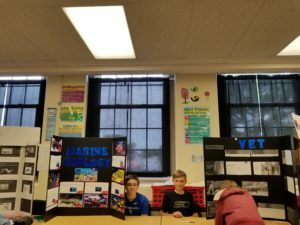 And as the school year came to a close and the block party arrived, teachers were impressed by the quality of the work their students had produced. The project team credits this result to two main features of the project’s structure: space for students to pursue an authentic passion for an authentic audience, and a robust structure of peer support. After the initial exploratory phase, students were divided into loose affinity groups, based on the topics they were beginning to pursue. With these peer groups in place, teachers were able to step back as “a studio kind of process, where the kids were supporting each other” took over, says Mascle. After a very successful year one, Making a Future For All is poised for even more success in year two. 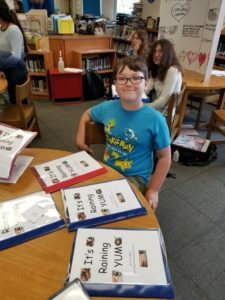 This year’s 7th-graders are next year’s 8th-graders, with a full project cycle and the experience of benefitting from peer review already under their belts. The team also expects that teachers, having seen the project through from start to finish, will be much more comfortable with letting go. “Until people have had the experience, it’s really, really scary,” says Moriarity. Looking towards the long-term, spreading the project both vertically and horizontally is a major priority. The team hopes that their efforts to introduce the project to the local high school will be aided by successive cohorts of graduating 8th-graders, and aim to start inviting elementary students to the Middle School block party. They’re also hoping to spread the concept to nearby communities through their Kentucky Writing Project network, already teaching a professional development session for primary and secondary teachers in another Eastern Kentucky School District.